While volunteering in the late 80's as a teacher in the Peace Corps, Damian Jones became inspired by the artisans of the Kathmandu Valley and intrigued by the use of glass beads in the Nepalese culture. Damian visited many artisans and artisan groups in various regions of Nepal, and observed the artisans as they created unique jewelry designs. Damian recognized that although the designs varied from place to place, there was one undeniable constant across all villages: women’s lives changed dramatically when they had an income. Upon his return to the United States, Damian began to conceptualize the idea of working with artisans in a fair, dignified manner as a way to improve their lives. Damian quickly realized that if they were going to succeed in a global marketplace, he would need to emphasize continual design and re-resign. 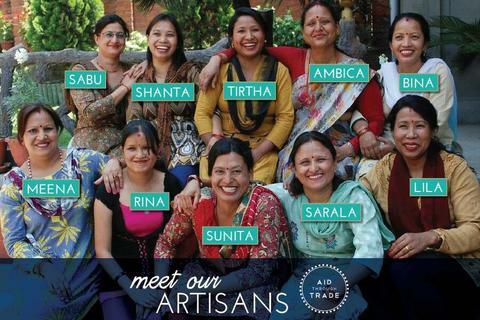 Aid Through Trade is one of the leaders in the fair trade fashion industry, and employs over 200 Nepali women artisans. The company was one of the founding members of the Fair Trade Federation.